“What we gonna do?” “I dunno, what’cha wanna do?”: What are we going to do? I don’t know, what do you want to do? Note 1: English doesn’t have as many “measure words” as Chinese, but there are several “measure words” for groups of animals: a herd of elephants/cows/sheep, a pack of wolves/dogs, a flock of birds, a pride of lions, a school of fish, a gaggle of geese, a litter of puppies/cubs. As you watch the film, how many such “measure words” can you find? Synopsis: The following summary is adapted from http://www.gardearts.org/doc/6/Disney%20Kids%20Cinderella-Jungle%20Book.pdf; titles in quotation marks are songs. An orphaned boy, Mowgli, is raised by wolves in an Indian jungle, but when Shere Kahn, the tiger, returns to that part of the jungle, Bagheera, the panther, plans to guide him to the safety of the man-village. Kaa, the snake, interrupts their first night. At first Bagheera doesn’t notice Kaa, but he wakes up just in time to divert Kaa’s attention; then Mowgli pushes the huge snake out of the tree. Next they encounter a herd of elephants (“Colonel Hathi’s March”), and Bagheera rescues Mowgli one more time. Then they meet Baloo, a lazy bear, who “adopts” Mowgli. While Baloo is singing (“The Bare Necessities”), a group of monkeys kidnaps Mowgli. The monkeys take him to their leader, King Louie. 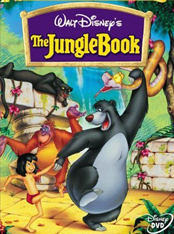 While King Louie tells Mowgli that he wants to learn how to be a man (“I Wan’na Be Like You”), Baloo, in disguise, distracts King Louie, while Bagheera rescues the boy. Bagheera convinces Baloo that Mowgli isn’t safe in the jungle, but when Baloo tells Mowgli, he runs away again, and is almost caught by Kaa (“Trust in Me”) and the tiger. When hope is almost gone, Mowgli is befriended by the Vultures (“That’s What Friends Are For”). Shere Khan arrives, but before he can attack, Baloo appears, rallying the other jungle creatures into battle. The battle is exciting, and it has a surprise ending I don’t want to spoil! Eventually, Mowgli “accidentally” ends up at the man-village, where a beautiful girl (Shanti) makes Mowgli face the choice between his desire to stay in the jungle, and this new feeling of wanting to be near Shanti and people of his own kind. The wolfpack elders were convinced that the best place for Mowgli was the man-village, but Mowgli disagreed (though you eventually chose to go to the man-village). Tell your partner of a time when you disagreed with a parent or teacher, but later found out he/she was correct and you were wrong. Is it difficult to move from one place to another (like Mowgli having to move from the jungle to the village)? Why or why not? Tell your partner some of the struggles you had when you had to move to a new place. Baloo: You better believe it. And you’re gonna love the way they tickle. / The bare necessities of life will come to you! / …So just try and relax. Yeah. Cool it. Fall apart in my backyard. ‘Cause let me tell you something, little britches: if you act like that bee acts… Uh-uh. You’re working too hard. And don’t spend your time looking around for something you want that can’t be found… / When you find out you can live without it / And go along not thinking about it / I’ll tell you something true / The bare necessities of life will come to you. 2. Bagheera: This will take brains, not brawn. 3. Mowgli: Hello. What are you doing? Mowgli: Can I do it too? Junior: Sure, just do what I do. But don’t talk in ranks. It’s against regulations. Colonel Hathi: Espirit de Corps. That’s the way I earned my commission in the Maharajah’s Fifth Pachyderm Brigade. Back in ’88 it was. Or… or was it? Winifred: Here it comes. The Victoria Cross bit [a worn-out speech] again. Colonel Hathi: It was then I received the Victoria Cross [award] for bravery above and beyond the call of duty. Ha ha! Those were the days. Discipline! Discipline was the thing! Builds character, and all that sort of thing, you know. 4. Mowgli (to the lifeless Baloo): Baloo, get up. Oh, please get up. Mowgli: You… you don’t mean… Oh, no. Baloo. Baloo (still talking to himself): I wish my mother could have heard this. Bagheera: It’s best we leave now. Come along, man cub. Baloo: Hey, don’t stop now, Baggy. You’re doing great! There’s more, lots more! ©2018 Michael Krigline. See our Website Standards and Use Policy.